A tennis ball can be a food puzzle! Tennis balls aren't just for dogs any more! 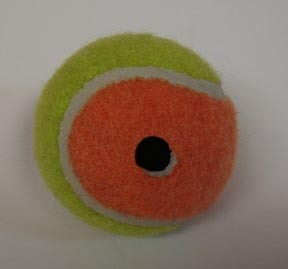 For a quick and easy food puzzle, you can use a Xacto knife to cut a hole in a tennis ball - voila! Brought to us by the Frederick Cat Vet in Maryland, which also has some other DIY ideas for creating food puzzles on their webpage. We are always excited to see veterinarians promoting the use of food puzzles!